I am a professional sculptor working mainly in green wood - combining my own studio practice with exhibiting, teaching carving, community and public art projects and residencies here and abroad. Although I have worked in other materials I am always drawn back to wood believing it to be such a magical, potent, living material. All my wood has fallen naturally, and I love that sense of giving it another life. Each piece has its own history and as I strip-off the bark there is a sense of releasing its spirit. My work has become more figurative over the years, initially after a year studying in Cyprus where I became fascinated by ancient Cypriot figures. I have always had an absolute need to carve, quickly learning that it is essential to my well-being, since my carving is a way of working out and expressing my innermost fantasies, feelings and dreams about this complex and confusing world. When I am carving I feel a connecting of the conscious and unconscious and this propels me into another state of mind. I have always had a deep fear of death and carving my sculptures is, perhaps, an attempt to evoke a form of immortality. Certainly the very physical presence of my sculptures means they become part of my family. 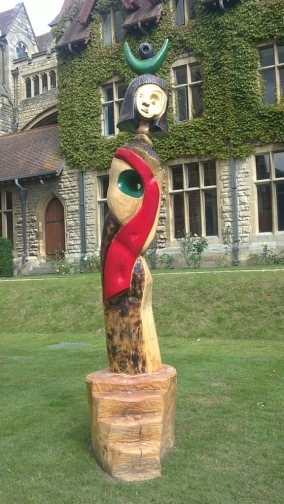 Natasha Houseago, born in Bristol in 1966, is predominantly an abstract figurative sculptor in wood, a direct Carver. Natasha gained a distinction at Jacob Kramer Art College, Leeds, in 1985. A fine Art BA [Hons] degree at Brighton College of Art, 1986-88. Also a Post Graduate Diploma in Cyprus in 2000. 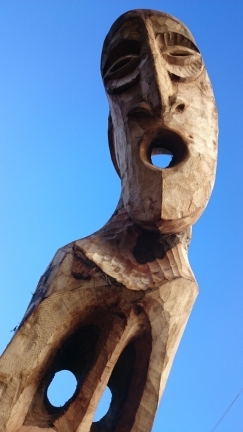 Houseago has over twenty years experience of teaching woodcarving, exhibiting, commissioned Art Projects and Residencies here and abroad. Natasha has won a award for Artists working in wood and has been sponsored by many tool companies. Natasha’s home and Studio are based in Cheltenham, where she is currently developing a new body of work and preparing for a series of future Exhibitions, Projects and Residencies. 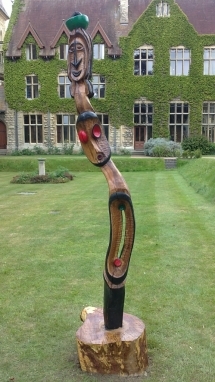 Abstract, contemporary, figurative Sculpture, hand carved in wood in Cheltenham, Gloucester, Tewkesbury, Stroud, Winchcombe, Stow, Guiting, Cirencester, Cotswolds, Gloucestershire, England.